The Bridge appears every twenty-seven years. Why not twenty-five or thirty, no one ever knew. We only knew that it came and went. We were not given the opportunity to visit the other side. There was a time when seven villagers rebelled and did cross the bridge. Never to be seen again. No one else dared to try. Who lived there? Why did they appear to us? Did they appear elsewhere? Unless you were a village elder, you were never to know. When it appeared, the village elders would go across, taking with them the harvests and goods for sale from the village. They are gone for three nights and return on the fourth morning. They would bring with them the name of one chosen to go across and stay. The one who would go, had one day to say goodbye to their family. Then, they’d leave and with them, the bridge would disappear for another twenty-seven years. This time, that person would be me. My name is Jered. I am my father’s only son. My mother died giving birth to my triplet sisters. Now, my father is old, my sisters aren’t married and I am leaving. Who will care for them, if not me? “Da, you know that every year a petition is offered and none ever granted. Why waste the time and energy? They took your uncle last time and nothing stopped it,” I replied as I packed. “OK, Da. Whatever you think is best.” I was tired of arguing with him about it. Nothing I said would change his mind. He’d go, just as his father had, and come back dejected and even more depressed than when he’d first gone to them. I walked out of the house and headed to my party. It wasn’t much. My few friends, Bart, Devon and Lucinda were there. The townspeople would always set up a party pavilion for the person leaving and their friends were responsible for bringing the food and drink. In the morning, others would gather around for a farewell breakfast from the village. Then I’d be on my way across the mysterious bridge to the unknown. We sat around, just the four of us, reliving old times and lamenting new ones that I’d never share—Lucinda and Devon getting married now that neither of them was leaving, Bart taking over for his father as the town smithy. “So, why do you think the last three choosings have been from your family? First your grand-aunt, then you uncle, and now you?” Devon asked. “You seem awful calm about this,” Lucinda said. “What would you have done if it were one of your sisters? You’re so protective of them,” Bart asked after a resounding belch. “Yeah, we lose out on the biggest opportunities for profit that we have. They buy so much of our stuff at ridiculous prices,” Said Devon. “Well, that’s just payment for the person that they take. You know that,” Lucinda said. My friends stood and wished me well, Lucinda crying and Bart and Devon sniffing instead of letting their tears fall. I walked home and found my father sitting in the kitchen with his head in his hands. He looked up as I entered and I could see on his face what I had already expected—I was still leaving. We sat in the kitchen holding each other as my Da cried, then slept in my arms. My sisters came out of their bedroom and joined us. Each of them speaking quietly so as not to wake Da. When the sun rose, they left the kitchen to dress. I woke Da, and both of us went to bathe and dress as well. The breakfast was a solemn affair. I had expected people to celebrate the fact that none of them were going. But they were all subdued as if they all felt they were sending me off to my death. Of course, as my Da had explained, to them, that’s exactly what they were doing. Finally, the elders stated it was time. 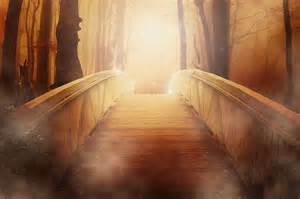 I stood, wished my family and friends well and walked with them into the forest, which lead to the Bridge. When we reached the Bridge, I was given a handshake by the elders and wished well. They still wouldn’t tell me what to expect. They said I’d see soon enough. So, taking a deep breath, I stepped on the Bridge and waited. Nothing happened so I began my journey. As I walked slowly across the bridge, I looked down into the river where my friends and I swam and fished so often. It never dawned on us that we were able to swim to the other side and nothing bad happened to us. Now, however, I walked across the bridge and felt a shimmering passing over and through me as I stepped closer to the other side. I felt as if I were being pulled away from and back into myself again. A shimmering gold and silver warped around me like the rain. I opened my eyes and saw in front of me the most exquisite view, which hadn’t been there before. One that none of my family or friends would ever see until the next choosing in twenty-seven years.